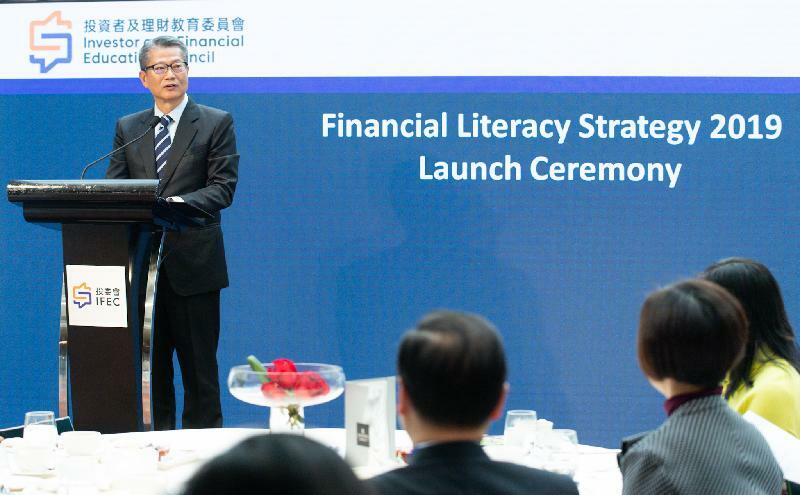 I'm pleased to be here today for the launch of the latest version of the Financial Literacy Strategy, with a continuing and vitally important mission to advance the financial literacy of the people of Hong Kong. That mission was set in motion with the establishment of the Investor Education Centre - now the Investor and Financial Education Council - in late 2012. It took flight three years later, with the release of the Hong Kong Financial Literacy Strategy in 2015, as mentioned by Lester. The new Strategy unveiled today builds on the inaugural version, applying what has been learned in the past three years about financial literacy and focusing on those who need it the most. It's also why this new version emphasises specific target audiences, including youths, working adults, the elderly, low-income families and those who struggle with low income and less community integration. Today's financial market is endlessly changing and complex, with technology increasingly driving financial innovation. At the same time, such societal changes as increased longevity have brought about new considerations and needs in financial planning, at both the individual and the community levels. In short, people today must be equipped with the relevant knowledge to make informed financial choices under rapidly changing socio-economic circumstances. That is certainly no easy task, Lester. Hong Kong, of course, is one of the world's leading international financial centres. We take pride in offering a wide range of financial services and products. The people of Hong Kong have long participated in the financial market through, for example, the trading of stocks. That said, there are clearly some concerns regarding Hong Kong's overall financial knowledge, according to a recent survey. For example, while about 80 per cent of the people of Hong Kong have financial goals, less than half have taken the necessary action to achieve those goals. Although four out of five people lived within their means, some 40 per cent of respondents lacked the emergency funds to respond to unexpected financial needs. And for those who borrowed money, about 20 per cent admitted to failing to make their debt repayments on time. To be sure, financial education - like education in general - is a long-term process, if not a life-long pursuit. In its six years of existence, however, the Investor and Financial Education Council has laid a solid foundation in enhancing the financial literacy of our people, including the elderly, working adults, youths and school children. I'm pleased to note the Council is hardly alone on the financial education front. The Hong Kong Monetary Authority, for example, has launched a Consumer Education Programme. It offers tips on banking and related products and services. That includes the recently launched Faster Payment System, as well as stored-value facilities, Internet banking services, ATMs and credit cards. And HKMC Annuity, a subsidiary of the Hong Kong Mortgage Corporation, runs a campaign to boost public awareness of the suitability, and, of course, the associated risks, of using your life annuity as a retirement-planning solution. The Securities and Futures Commission issued guidelines relating to the distribution and trading of virtual assets in last November. The Commission, of course, oversees the new Investor and Financial Education Council. I am confident that under the able leadership by Lester, the new Council will build on the good work done by its predecessor in advancing financial literacy in Hong Kong. Certainly, the Investor and Financial Education Council has the full support of the Government. A financially informed public can make a difference for all of us. 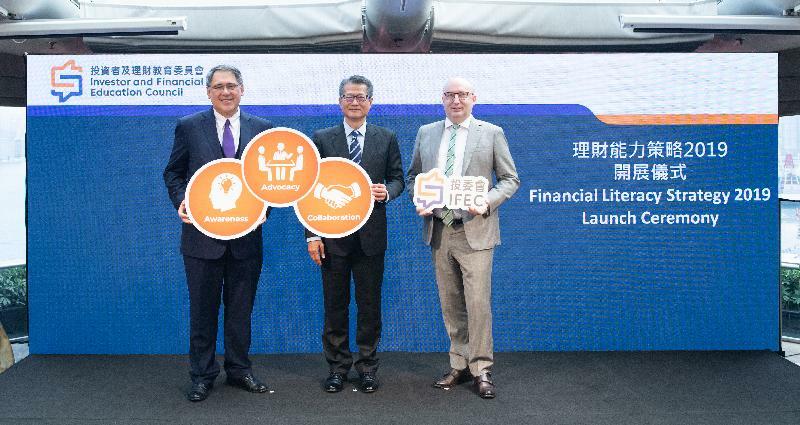 My thanks again to all those involved in creating the new Financial Literacy Strategy, from the Council's predecessor, the Investor Education Centre, to the Education Bureau, our four financial regulators, representatives of the Hong Kong financial industry and many stakeholders. Ladies and gentlemen, I wish you all a new year blessed with health, happiness and financial well-being.